BARBOURS — First there was the flood and then the fire. For the second time in little more than six years, Howard and Mildred Campbell are without a home. In the devastating flood that struck the area in September 2011, Loyalsock Creek — which runs along Scaife Road — left more than 3 feet of water in the couple’s two-story three-bedroom house at 591 Scaife Road. “We were out of the house 85 days,” Campbell, a retired supervisor for the former Stroehmann Bakery, said. Early Wednesday morning, fire broke out in one of the couple’s unused bedrooms, forcing the Campbells to dash down a stairwell and out the back door. “That’s the only way we could get out,” Howard Campbell said, fighting back tears as he stood outside the house hours after the two-alarm blaze ripped through the property. 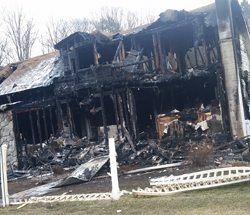 “I went to bed at 9 p.m. My wife came to bed about midnight.” By 1 a.m., the second bedroom was engulfed in flames. “My wife heard a noise. She saw orange layers around a dormer,” Campbell said, adding that Mildred alerted him once she put on her glasses and realized what she saw were flames. “Howard, we got a fire,” he recalled her saying. He ran barefoot to a neighbor’s to get help. Plunketts Creek Township Fire Chief Brad Stine said the front of the house was “engulfed in flames” when firefighters reached the scene, about a half a mile off of Proctor Road. “I doubt that we’ll be able to save very much at all. I know we lost a lot of antiques,” said Howard Campbell. He was prohibited from entering the house until a state police fire marshal arrived and completed his inspection of the home. Among other personal possessions that Howard Campbell feared were gone was his life-long collection of stuffed animals. Stine said the cause of the fire remained under investigation. He said there was nothing suspicious about the fire, which he estimated caused in excess of $100,000 damage. The Campbells have insurance. Now he and his wife plan to start all over yet again. “We’re going to re-build,” he said. Tears welled up in his eyes as he stopped to hug a friend, one of many who dropped by to offer loving support and encouragement. The Campbells are staying with relatives.